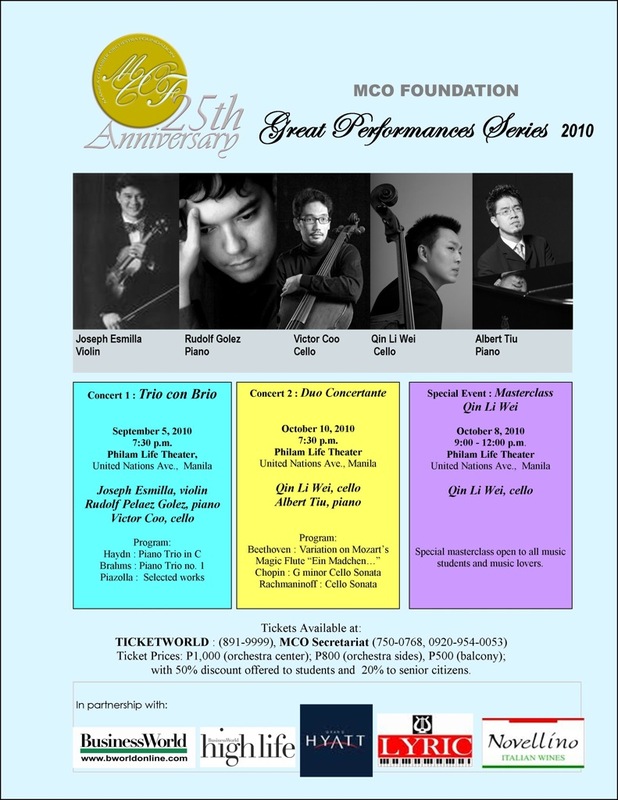 The Manila Chamber Orchestra (MCO) Foundation continues to celebrate its 25th year with its upcoming “Great Performances Series," a Season of events featuring two-top caliber concerts and a cello masterclass. In a presscon held on August 17, 2010, Angel Nacino, Executive Director of MCO Foundation shared to us the background of the organization and what the group has been doing since its inception in 1985. The Foundation was established to give a home for a chamber orchestra at the PCI Bank Building which was under the leadership then of Antonio H. Ozaeta. As the flagship project of the MCO Foundation, the MCO Arts Festival is the annual Season of Performances that feature seasoned and the best Filipino talents in various concerts (mainly classical), such as orchestral, chamber, voice, jazz and ballet and chamber opera. The 3 Master musicians of the Manila Chamber Orchestra Foundation performed a sample of their favorite music: Rudolp Pelaez Golez for piano, Victor Coo for cello and Joseph Esmilla for violin. The Season opens on September 5, 2010 at 7:30 p.m. at the Philamlife Theater with a concert entitled “Trio Con Brio” which will be an evening of piano, cello, and violin -- featuring some of the most beautiful piano trios that encompass the whole music generation. Concert repertoire will include the piano trio works by Joseph Haydn, Ludwig Van Beethoven, Johannes Brahms and Astor Piazolla. 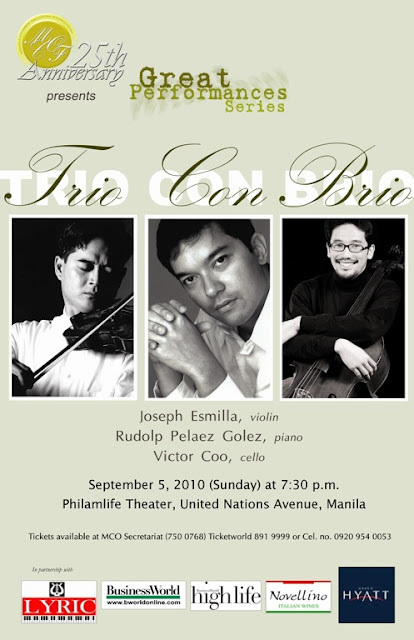 Three world class Filipino musicians will perform together for the first time for this special evening headed by violinist Joseph Esmilla, pianist Rudolf Pelaez Golez and cellist Victor Coo. Both Esmilla and Golez entered Juilliard School of Music at a very young age. Esmilla studied with prolific pedagogues including Dorothy Delay and later with Felix Galimir at the Mannes School for Music. Golez studied with Seymour Lipkin and after graduation went to Graz, Austria for further studies. Both artists continue to perform as soloist and chamber musician outside the country. Mr. Coo graduated from Michigan State University and University of MaryLand under the tutelage of Suren Bagratuni and currently based in Taiwan busy as a soloist and chamber musician. The next concert will be on October 10, 2010 (Sunday) 7:30 p.m. entitled “Duo Concertante” which will feature the sensational and young Chinese cellist Qin Li Wei and Singapore-based Filipino pianist Albert Tiu in an evening Beethoven, Chopin and Rachmaninoff. On October 8, 2010 (Friday) from 9:00 – 12:00 noon, Mr. Qin (cellist) will also give a rare masterclass to top 5 young Filipino cellists. The masterclass will also be open to the public. These events will be held at the PhilAm Life Theater. The Manila Chamber Orchestra Foundation, Inc. (MCOFI) is a non-stock, non-profit institution first established in 1985 dedicated to the promotion of classical music and the cultural arts. The Foundation has had countless and notable performances in various concert halls, schools, universities; and lecture-series on the arts for business executives, etc. Throughout the years, MCO Foundation has remained active in the cultural arts scene. Hence, it has earned the high esteem and regard of the Arts-loving Community, and has been acclaimed as “Makati’s Cultural Oasis” and “Hall of the Classics." Both concerts are made possible through partnerships with Hyatt Grand Hotel, BusinessWorld, HighHopes, Lyric Piano, Novelino Wines and MCA Music. For tickets, please call TICKETWORLD at (632) 891-9999 or MCO Foundation at (632) 750-0768.